This simple gluten-free recipe is a delicious addition to salad, or a main dish to have with a selection of vegetable side dishes. It also makes a great snack or picnic food. This recipe is basic, but it’s easy to jazz it up with fresh or dried herbs, garlic or spices. 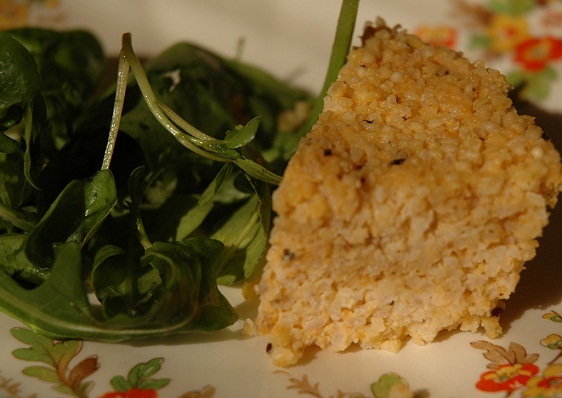 Millet is a highly nutritious food and is easy to digest. It is high in protein and B vitamins, as well being a good source of iron, magnesium, potassium and zinc. Heat the oven to 200C / 400F / Gas 6 and lightly grease a medium sized cake tin. Cook the millet in the stock for about 20 minutes or until the millet is soft and nearly all the water is absorbed. Add the cheese and the salt and pepper. Pour the mixture into the cake tin, level the top and put it in the oven. Cook the cake for 15-20 minutes, or until the top is just starting to brown. Cut into quaters or slices and serve hot or cold with salad or vegetables.